You’ll remember Metro bus rider Reginald Millender from last Saturday’s post. The first day I met him, he was assigned to bus route 124, which goes from 3rd Avenue and Pike Street to Tukwila International Boulevard Station. Despite not being rush hour, the articulated bus was standing-room only for about half of the journey. Millender said many people were going to the food bank at St. Vincent de Paul MIssion, which is open every Tuesday and Thursday. 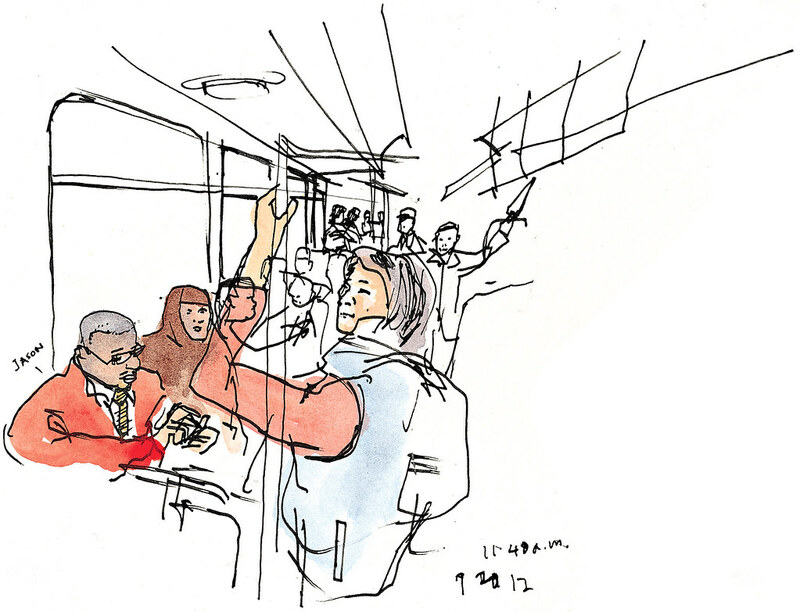 I drew the sketch above –except for the color– while standing on the front of the bus. Jason, the young fellow with the tie, said he was coming back from filling out a job application at McDonald’s. Below is another sketch of Millender that I didn’t include in my post last week. I drew it while he enjoyed his routine of drip coffee and raspberry bar at the 4th Avenue and Union Street Tully’s before his shift.